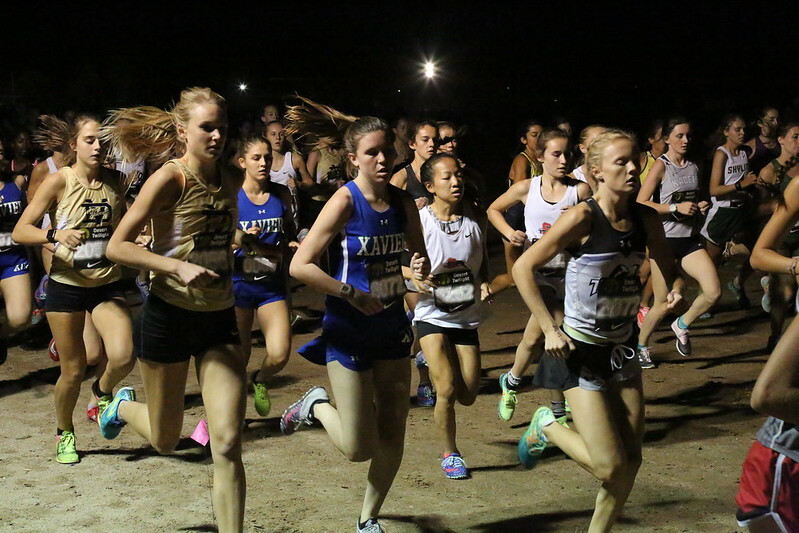 Friday, September 29 was the 11th Annual Desert Twilight Cross Country Festival in Casa Grande. This is a meet with the top teams from the West who come to compete on the 5k course comprised of a golf course and soccer fields. It’s always fun with a meet that starts in the daylight and finishes under the starry skies with minimal lighting on the course and spectators dodging each other as they run to watch in different locations. The boys and girls DVCC teams ran in all three races - Large School Freshman, Large School Open and Sweepstakes. The first race was the Girls Large School Freshman at 4:45 under the sunny skies. The girls points brought home 6th place! The freshman team was lead by Hannah Garcia (22:34) in 21st place, Lia Rao (26:09) 60th, Annika Beck (26:46) 72nd and Steeley Beringer (29:46) and Rylee Reginald (29:55) crossing the finish line practically together in 115th and 116th. Great race ladies! Two hours after the Freshman race started, the Girls Large School Open began. Our girls finished with an impressive 5th place! Maddy Shoemaker was the first to finish at 20:18 (11th), Kyra Mazanec followed at 20:51 (23rd), Sydni Nedza at 21:06 (30th), Keilani Fang at 21:10 (31th) and Sarah Crall at 21:25 (38th). Congratulations girls! The 2nd to last race of the evening was the Sole Sports Girls Sweepstakes race. The crowd always goes wild for the sweepstakes races and the course is full of cheering spectators. Haley Wolf crossed the finished line in 2nd place with an amazing time of 17:21, followed by Katy Clausen at 18:32, Laurel Froehlich at 19:03, Soraya Holley at 19:31, Allison Estrada at 19:40, Brooklyn Christofis at 20:03 and Quinn Boardman at 20:13. These scoring times earned the girls a notable 6th place finish among some amazing teams! Thanks to everyone who came and cheered for the girls and the team. This meet always has a great vibe and is a lot of fun for the kids (rocking DJ and all)!